Fasten your seat belt! Your toddler's probably on an emotional roller-coaster now: One minute he's as happy as ever, and the next he's a mess. It may be a year or two before he outgrows temper tantrums. Until then, expect to deal with regular outbursts of anger and frustration. I love our little spazz! Even if he is certifiable. Ohh I hear ya, the TODDLER STAGE! AHHH!! Is this what they call "the terrible twos? "....you will have your hands full with the new baby coming along, hope Fox won't be jealous! 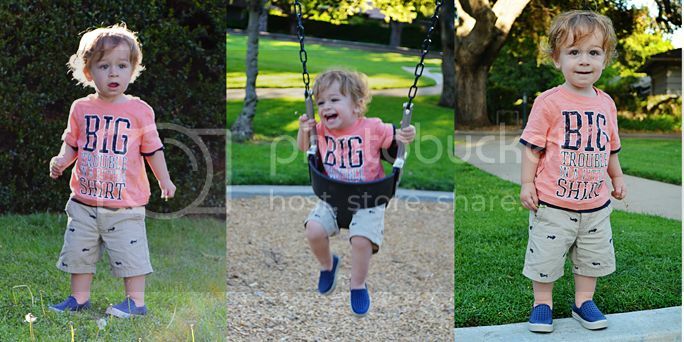 okay, that picture of him laughing in the swing is beyond precious!!!!!! hehe he has an awesome smile. That shirt is pretty perfect for him too. Hopefully he'll grow out of this little tantrum stage sooner than later!